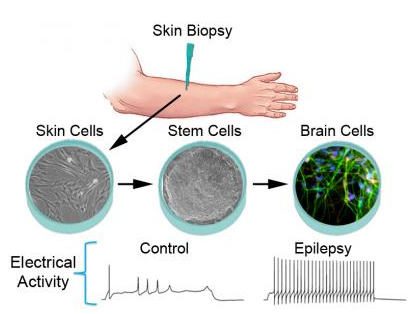 A new stem cell-based approach to studying epilepsy has yielded a surprising finding about what causes one form of the disease, and may help in the search for better medicines to treat all kinds of seizure disorders. The findings, reported by a team of scientists from the University of Michigan Medical School and colleagues, use a technique known for creating diseases in a dish, or in this case "epilepsy in a dish". "With this technique, we can study cells that closely resemble the patient's own brain cells, without doing a brain biopsy. It appears that the cells are overcompensating for the loss of channels due to the mutation. These patient-specific induced neurons hold great promise for modeling seizure disorders, and potentially screening medications." says senior author and team leader Jack M. Parent, M.D., professor of neurology at U-M and a researcher at the VA Ann Arbor Healthcare System. Having a U-M team that includes experts in induced pluripotent stem cell biology, sodium channel physiology and epilepsy genetics expertise helps the research progress, Parent notes. "Epilepsy is a complicated brain network disease. It takes team-based science to address it." he says.